On Bastille Day, San Francisco’s French residents have another reason to celebrate. For the past 40 years, French tourists have been coming here hoping to find a blue house on a hill. 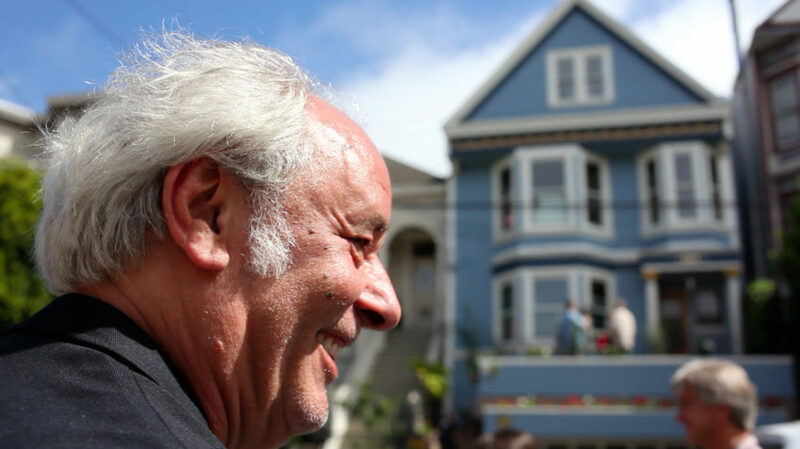 In a song called “San Francisco,” which came out in 1972, French singer Maxime Le Forestier spoke of a house where everyone was welcome, where Tom, Phil and Psylvia lived. The house was in fact home to the Hunga Dunga commune, and several of the people mentioned in the song still live in the Bay Area. Last year, a French intern at the San Francisco Chronicle got in touch with the singer, and after digging through old notebooks, Le Forestier found the address: 3841 18th Street. However, when the young journalist, Alexis Venifleis, walked up to the house, it had been painted green. He wrote an article about it. Word spread, and soon there was a clamor to have the house repainted in blue. Shortly after, Ressource, a French paint manufacturer, offered to paint it for free. The owners, Amy Silverstein and Angela Padilla, agreed. The French now have their blue house back. Hélène Goupil is an editor at Mission Local and a lecturer at U.C. Berkeley's Graduate School of Journalism. She's the co-author of "San Francisco: The Unknown City." In 2008, she helped start Mission Local. Hélène is a French native and San Francisco adoptee. She likes visual storytelling and good food. ……..And they lived happily ever after. Yay! Angela Padilla does wonderful work rescuing dogs with Family Dog Rescue. The spirit of the place must still be intact — but now, every dog is welcome!